Past speakers have included American and foreign diplomats, policymakers, university scholars, and leaders of the business, non-profit, and cultural communities. We also periodically host short-term resident visiting scholars and practitioners from the United States and around the world to share their expertise and diverse perspectives with the St. Edward’s University community. The Kozmetsky Center convened a forum in the Jones Global Events Center entitled "Challenges to the Western Liberal Order" featuring leading policy officials and academics representing nations of the transatlantic community, Russia and China to discuss challenges to the rules and traditions and values of the existing Western liberal order. Forum participants explored the pressures on domestic and international political and financial institutions and communities to adapt to the changing global power configuration and rapidly evolving international security, economic, financial and social developments. During this conference, panelists shared perspectives on the importance of Russia’s bilateral and multilateral relationships with Western nations, immediate and longer-term strategic interests and priorities, economic and security aspects of Russia’s relationships with Western countries, significance that should be assigned to values in defining these relationships, and overall implications of Russia’s relationships with Western nations for the contemporary and potential emerging geopolitical world order. The sessions featured leading international experts on religion-security with current and former senior policy officials and religious clerics to exchange perspectives on a range of issues including violent extremism and terrorism, religious drivers in contemporary geopolitical divisions, and religious contributions to conflict resolution, economic development and other areas of human security. This session included panels considering the academic and policy dimensions of contemporary migration challenges from a comparative perspective, focusing particularly on issues and case studies in Europe, Eurasia, and U.S.-Mexico/Central America. Experts presented research findings from these regions and considered the moral and security dimensions of migration management. The Kozmetsky Center partnered with the Center for Russian, East European, and Eurasian Studies and the Center for European Studies at the University of Texas, Austin to host a working seminar devoted to analyzing sources of violent extremism and methods for countering the threat. The session explored U.S., European, and Eurasian national perspectives on sources of violent extremism, and assessed the success of methods employed to delegitimize extremist narratives and recruitment. Energy resources have been directly linked to major geopolitical developments over the last two centuries. Coal fueled the rise of the British Empire, while Middle Eastern oil had a major role in conflicts of the 20th centure. Renewable energy will account for perhaps a thrid of all commercial energy use in a couple of decades. Mr. Sarang Shidore, Visiting Scholar at the LBJ School of Public Affairs at the University of Texas at Austin, delivered an expert lecture on the potential geopolitical consequences of the coming age of renewable energy including a discussion of the implications for addressing global climate challenges. Dr. Monde Muyangwa's lecture focused on a broad ranging assessment of security and economic priorities for the continent of Africa and offered her suggestions for the U.S. policy community in developing future policy that could contribute to building productive U.S.-Africa relationships in the future. Her remarks touched on potential contributions governments, the private sector, and civic and religious institutions could make to foster sustainable development, elevate living standards, and promote peace and security on the continent. Dr. Charles Porter's book talk focused on water security and water rights in a local, state, and international context examining insights from his newest publication, Public Water Policies: The Ultimate Weapon of Social Control (Roman and Littlefield: 2018), which provides a new perspective on the overall long-reaching economic conseqences of water policy. This forum brought together U.S. military leadership & academic/policy subject area experts for a broad ranging exchange of perspectives on issues including nuclear non-proliferation, arms control/deterrence, and terrorism. The distinguished panel of speakers also discussed graduate study opportunities avaialle in the areas of nuclear security. Dr. Lourdes Casanova, Director, Emerging Markets Institute (EMI) delivered a lecture on campus on October 23, 2018, on several topics including, insights from her most recent trip to China; her published research in the 2017 and 2018 emerging markets reports; and previewed the upcoming events at EMI. The lecture covered several substantive topics in the context of emerging markets. Dr. Casanova and her team at the EMI focus their analysis on an index of countries, which they call the E20—the 20 largest emerging markets in the world. She suggested that emerging markets should not only seek investment, but also pursue strategies encouraging investment abroad as the optimal means for generating economic growth. On October 9, 2018, the Kozmetsky Center hosted the visit of Pjer Šimunović, Ambassador of the Republic of Croatia to the United States in cooperation with the World Affairs Council Austin. The discussion included developing US-Croatia educational exchange opportunities, US (and Texas) investment in Croatia and South Eastern Europe, regional power competition in South East Europe and security challenges for Croatia, wider Europe and beyond. On Thursday September 27, the Kozmetsky Center featured our first event for the 2018-2019 AY entitled “Understanding Exploitation of the Internet and Social Media in Promoting Violent Extremism and Terrorism” presented by Dr. Maura Conway, Professor at Dublin City University in Ireland and Director of the European Union Framework Programme Network of Excellence in Violent Online Political Extremism, entitled VOX-Pol, launched in January 2014. The VOX-Pol project supports a consortium of universities funded by the European Union to promote research and collaboration toward bettering understanding the vulnerabilities of the cyber sphere to exploitation by terrorist and violent extremist networks. Professor Conway currently collaborates with a network of colleagues in Computer Science tracing extremist networks on Twitter and developing methods for analyzing violent online political extremist material. Dr. Conway has participated widely as a leading international expert speaker on the topic of terrorist exploitation of the internet including at the United Nations, the Commission of the European Union in Brussels, the Royal United Services Institute (RUSI) in London, the Irish Military College at the Curragh, the Danish Institute of International Affairs in Copenhagen, and elsewhere. Dr. Conway serves as an editorial board member for the journals Media, War, & Conflict and Irish Studies in International Affairs. In addition to her position as Vice-Chair of the International Affairs Committee of the Royal Irish Academy, she is a past-Chair (2011 – 2012) of the International Studies Association’s (ISA) International Communication Section. Prior to assuming her current faculty position at Dublin City University, Dr. Conway was a Teaching Fellow in the School of International Relations at the University of St. Andrews, Scotland, and she has also been Visiting Professor in the Centre for Contemporary Middle East Studies at the University of Southern Denmark. Dr. Conway’s lecture supports the Global Understanding Workshop devoted to the theme "Unraveling Global Terrorism” and is open to the campus community. Dr. Conway's visit included a roundtable session held with representatives of Austin's academic, policy and private sector communities working in digital/technology security and global strategy sponsored by the Irish Consulate in Austin and Global Austin. On Tuesday April 24, the Kozmetsky Center hosted a screening of Ai Weiwei’s award-winning documentary film: “Human Flow." With over 65 million people around the world being forced from their homes to escape famine, climate change and war in the greatest human displacement since World War II, this documentary features interviews with immigrant refugees providing first-person insights into their experiences. Viewers of the film will explore a chain of urgent human stories that stretch across the globe in countries including Afghanistan, Bangladesh, France, Greece, Germany, Iraq, Israel, Italy, Kenya, Mexico, and Turkey. Following the broadcast of the film, students will had the opportunity to discuss and refine their current understanding of the true scale of the international refugee crisis in the twenty-first century. St. Edward's University faculty Dr. Rodrigo Nunez and Fr Louis Brusatti participated in a forum following the session offering reactions to the film and sharing perspectives with students. On Tuesday March 20, the Kozmetsky Center convened a forum of leading international experts entitled “Managing Challenges in Cyber Security.” Panel speakers explored security challenges of the cyber arena and assess both public and private sector measures to address these threats. Professor Sean S. Costigan serves on the faculty at the George C. Marshall European Center for Security Studies and directs ITL Security, a consulting firm on cybersecurity and technological risk. Professor Costigan’s current research and teaching focuses on the nexus of cybersecurity, crime and terrorism. His most recent work is on cryptocurrencies and encryption. Costigan led the team that developed the NATO/Partnership for Peace Consortium PPC Cybersecurity Reference Curriculum published in four languages in 2017. Costigan previously served as a member of the Private Sector Program at the Office of the Director of National Intelligence, examining the risks associated with 3D printing. He served as Chief Information Officer of The MIT Press; Associate Professor at The New School Graduate Program in International Affairs; Director for Strategic Initiatives, Center for Security Studies ETH Zurich; Visiting Fellow at the University of Calcutta's Institute of Foreign Policy Studies; Executive Editor at Columbia International Affairs Online; Research Associate for Science, Technology and Defense Industrial Policy at the Council on Foreign Relations; and on the staff of the Weatherhead Center for International Affairs, Harvard University. He is also presently serving as a Senior Adviser to the NATO/Geneva Center for Security Policy/Partnership for Peace Consortium Emerging Security Challenges study group where he leads a team on cybersecurity. He also serves as Senior Associate at the Security Governance Group and Associate at i-Intelligence. On February 13, the Kozmetsky Center featured a panel of expert scholars devoting their research agendas to exploring the intersection of religion and domestic and global societies. The first featured panel speaker Dr. Jodok Troy is recipient of the Erwin Schrodinger Fellowship and Visiting Scholar at the Freeman Spogli Institute for International Studies Stanford University. Jodok Troy is among the leading experts in religion and ethics and international relations and security in Austria and teaches and conducts research at the University of Innsbruck and the University of Applied Sciences in Vienna. Dr. Troy held a prior research fellowship at the Center for Peace and Security Studies at Georgetown University, and was an affiliate scholar of the Swedish National Defence College. He is the author of Christian Approaches to International Affairs, Palgrave Macmillan and his articles have appeared in Politics, Religion & Ideology, Diplomacy & Statecraft, The Hague Journal of Diplomacy, and Cambridge Review of International Affairs. Troy holds a Ph.D. from the University of Innsbruck. Dr. Troy discussed his current research project at Stanford University focused on examining international moral leadership in the examples of the Popes and those serving as Secretary General of the United Nations. The Kozmetsky center held a lecture entitled “Invisible: Surviving the Cambodian Genocide” offered by Dr. Fran Pilch, Professor Emeritus of the United States Air Force Academy. Dr. Pilch’s lecture incorporated insights from the course she developed for the Air Force Academy entitled “War Crimes, Genocide, and Human Rights,” and extensive research included in her book released on this topic in 2017. Dr. Pilch served as a Fulbright-Hays Scholar in South Africa and a Fulbright Scholar in Mongolia, where she taught International Law at the School of Diplomacy, National University of Mongolia, in Ulaanbaatar. In 2011-12, she was named the Case Carnegie Colorado Professor of the Year. She was awarded her B.A. from the University of Connecticut and her M.A. and Ph.D. in International Relations from Yale University. Dr. Pilch’s lecture concentrated on the actual accounts of survivors of Pol Pot’s genocide which claimed the lives of an estimated two million people—more than one-fourth of the total Cambodian population. On Wednesday evening November 8, the Kozmetsky Center featured a forum concerning Cuba's future; the session featured leading specialists of the academic and business communities on various aspects of Cuban society, economy and foreign policy offering a diversity of perspectives on Cuba and the United States-Cuba bilateral relationship. 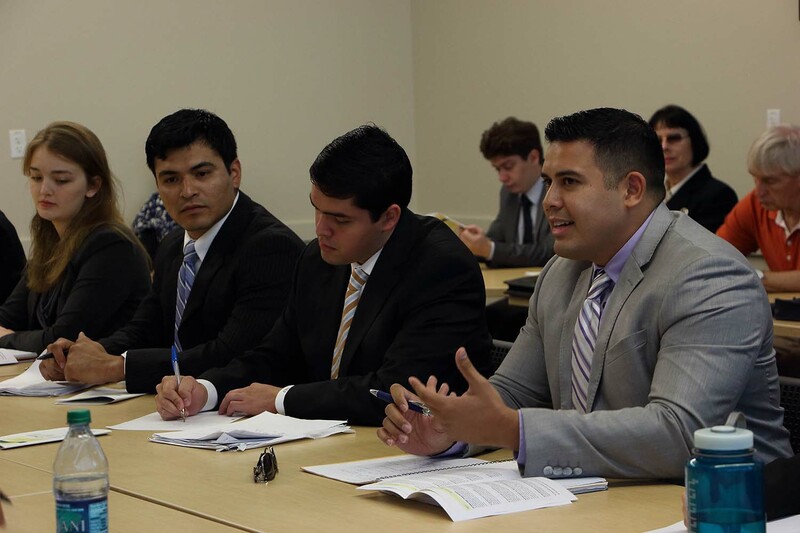 The objectives for this event were to heighten student and public awareness of political and economic circumstances in contemporary Cuba, and to explore various policy options for achieving long-term desired end-states in the United States relationship with our geographically close neighboring nation of Cuba. The session devoted significant focus to assessing the state of Cuba’s economy, investment opportunities and potential contributions of the American and Texas private sector and civic engagement to Cuba’s future and the development of the United States relationship with the island of Cuba. Dr. Okunev earned his Ph.D. from the Moscow State Institute of International Relations in 2011, where he currently serves as Vice Dean for Research in the School of Political Affairs and Associate Professor of Political Geography and Geopolitics. Among his teaching and research interests are political geography, geopolitics, comparative politics, and federalism. Dr. Okunev is the author of two books, Geopolitics of Microstates and Capital Cities as a Critical Geopolitics Mirror, and co-author of the textbooks Comparative Politics and World Regional Studies. He currently serves as executive secretary of the journal Comparative Politics Russia. Dr. Okunev will be offering lectures and participating in seminar visits for courses at St.Edward's as well as providing a series of guest lectures on various aspects of Russia's foreign policy and world geopolitics sponsored by Global Austin and other community organizations. The Kozmetsky Center hosted Ambassador Mary Ann Peters, Chief Executive Officer of The Carter Center to share her perspective on the importance of international education and study abroad with St. Edward's University students. Previously, Ambassador Peters was Provost of the U.S. Naval War College from September 2008 to July 2014. Prior to joining the Naval War College, she was Dean of Academics at the College of International and Security Studies and Associate Director of International Liaison at the George C. Marshall European Center for Security Studies in Garmisch-Partenkirchen, Germany. Ambassador Peters spent more than 30 years as a career diplomat with the U.S. Department of State. From 2000 to 2003, she was U.S. Ambassador to Bangladesh, leading the mission's efforts in support of the war on terrorism and other key U.S. foreign policy goals. She received a Presidential Meritorious Service Award in 2003 for her work there. Prior to her posting in Dhaka, Ambassador Peters was the Deputy Chief of Mission at the U.S. Embassy in Ottawa, Canada, responsible for the management of the embassy and supervision of the six U.S. consulates general in Canada. From 1995 to 1997, Ambassador Peters served in the White House as Director for European and Canadian affairs at the National Security Council. Among other portfolios in this position, Ambassador Peters worked on the diplomatic and security aspects of the search for peace in Northern Ireland. She previously served as Deputy Assistant Secretary of State with oversight responsibility for U.S. relations with 19 Western European countries and Canada, as Deputy Chief of Mission in Sofia, Bulgaria, as Economic Counselor in Moscow during the Soviet era, and as the last U.S. Consul in Mandalay, Burma. From 1988 to 1990, Ambassador Peters was the Deputy Director of the Office of Pakistan, Afghanistan, and Bangladesh Affairs in the State Department. Ambassador Peters completed her undergraduate study at Santa Clara University in California and holds an advanced graduate degree in International Studies from the Johns Hopkins School of Advanced International Studies. Her formal education also included courses at the Institut d'Etudes Politiques in Paris. She is a member of the Council on Foreign Relations and Women in International Security. The Kozmetsky Center of Excellence in Global Finance, The Bill Munday School of Business, World Affairs Council - Austin hosted the Austin Global Business Forum to discuss Austin’s expanding international business engagement, featuring representatives from the Office of the Governor of Texas, Austin Business Journal, and other professionals based in the local community with extensive experience in business and finance throughout various regions of the world. On February 8, the Kozmetsky Center featured a lecture "Challenges and Opportunities in United States-Mexico Relations" by Dr. Guadalupe Correa-Cabrera, Associate Professor at the Department of Public Affairs and Security Studies, University of Texas Rio Grande Valley and residential fellow at the Woodrow Wilson International Center for Scholars in Washington DC. On December 5, the Kozmetsky Center hosted a visit with Dr. Dianne Barton, Water Quality Coordinator at the Columbia River Inter-Tribal Fish Commission (CRITFC), for a lecture on “Native American Perspectives on Science, Spirituality, Nature, and the Environment.” View the presentation from this event. The Kozmetsky Center featured a session in our ongoing international seminar exchanges on contemporary global issues among students of St. Edward’s University with the Moscow State Institute of International Relations of the Ministry of Foreign Affairs of the Russian Federation (MGIMO) and Friedrich Schiller University in Jena Germany. President Atifete Jahjaga is the first woman president of the Republic of Kosovo and fourth to be elected in the international community, approved by the Parliament of Kosovo on April 7, 2011. President Jahjaga was also the youngest woman to be elected to serve in the presidency or top leadership post among nations in the world community. President Jahjaga spoke on "Leadership, Public Service, National and Global Security Challenges and Opportunities: Perspective of the President of the Republic of Kosovo 2011-2016." On October 4, the Kozmetsky Center hosted a lecture with U.S. Navy Rear Admiral (Ret.) David W. Titley, Ph.D., Professor of Practice in the Department of Meteorology and Atmospheric Science at Pennsylvania State University. Dr. Titley is an internationally recognized expert in the field of climate, the Arctic, and National Security, and founding Director of Penn State’s Center for Solutions to Weather and Climate Risk. The Kozmetsky Center is hosting Dr. Volodymyr Dubovyk, Visiting Senior Fulbright Scholar at St. Edward’s University for the 2016-2017 academic year. Dr. Dubovyk spoke at on September 12 on "Ukraine's Future Political and Economic Challenges: National & International Prospects." Dr. Jeffrey Haynes is Director of the Centre for the Study of Religion, Conflict, and Cooperation at London Metropolitan University, Convener of the European Consortium for Political Research’s Religion and Politics Standing Group, and chair of the International Political Science Association’s Research Committee on Religion and Politics. He spoke at St. Edward's University on "The Role of Religion in International Affairs." On February 8th, 2016, the Kozmetsky Center hosted a forum with leading experts and scholars from Russia, China, NATO, and the United States to discuss the rise of China and Russia and the implications of their rise for changing geopolitics and security. The panelists represented leading academic and policy organizations, including: Dr. Artyom Lukin, Professor, Far Eastern Federal University, Vladivostok; Dr. Gao Fei, Professor, China Foreign Affairs University, Beijing; Dr. Igor Zevelev, Director, MacArthur Foundation, Moscow; Dr. Alexei Voskressenski, Dean, Moscow State Institute of International Relations; Dr. Matthew Rojansky, Director, Kennan Institute, Woodrow Wilson Center; Dr. Paul Bolt, Professor, United States Air Force Academy; and Dr. Detlef Puhl, Senior Advisor, North Atlantic Treaty Organization NATO. Dr. Carmen Gonzalez is Professor of Law at Seattle University and works at the nexus of policy and law to identify legal and societal challenges that exacerbate issues in food security. She discussed opportunities and challenges to creating a more enabling global environment for food security considering human rights, environmental law, and international trade law. This event featured Dr. Kiril Avramov, an assistant professor of Political Science in the Department of Political Science at the New Bulgarian University in Sofia, Bulgaria. He is researching the effect of conspiracy theories on the political discourse in Central and Eastern Europe. This event featured former U.S. Ambassador to Greece (2011-2013) Assistant Secretary of State for Intelligence and Research Daniel B. Smith, Senior Associate Fellow of the Defence Academy of the United Kingdom Dr. Julian Lindley-French, Chair of the Department of International and European Economic Studies (DIEES) at Athens University of Economics and Business Dr. Panos Tsakloglou, and other speakers offering diverse European national perspectives on the issue. On October 13, 2015, the Kozmetsky Center hosted a visit with cyber security expert Dr. Kenneth Geers, Professor at Taras Shevchenko National University of Kyiv and Ambassador for the NATO Cooperative Cyber Defense Centre of Excellence in Estonia. Dr. Geers spoke on Public and Private Dimensions of Global Cyber Security, including the impact of cyber security on international affairs and global security. This event featured Jovica Palashevski and Pavel Iliev, two emerging leaders in global finance with worldwide experience in the public and private sectors, who offered perspectives to students of St. Edward’s University on preparing for careers in global business, finance, and economics. On February 25, 2015, the Kozmetsky Center hosted a visit from leading scholars to discuss religious perspectives on the ongoing conflicts in the Middle East, and how interfaith dialogue may contribute to conflict resolution efforts in the Middle East and globally. The forum explored the security priorities, vision, and suggestions for conflict resolution from the traditions of Judaism, Islam, and Christianity. The Kozmetsky Center hosted the visit of Dr. Rafael Biermann, professor of International Relations and Director of the Department of Political Science at Friedrich Schiller University in Jena Germany to discuss "Secessions in International Order". Dr. Biermann also met with campus administrators & faculty to discuss academic partnership opportunities in Germany. Dr. Mitrofanova participated in a roundtable discussion with St. Edward's faculty and leadership on issues including exploring possible collaboration on curriculum development and courses, student and faculty exchanges, research and joint service projects. Dr. Edward J. Williams, professor emeritus of the University of Arizona, spoke on “The Borderlands: Conflict, Crisis, Cooperation, and Comfort,” focusing on socio-economic issues for migrants and refugees, especially relating to challenges for families and children. International Policy & Academic Perspectives on the Impact of the Ukrainian Conflict: A New Cold or Hot War? This event featured an exchange of perspectives among academic and policy experts of Ukraine, Russian Federation, European Union/NATO, United Kingdom, Germany, and the United States to discuss the ongoing conflict in Ukraine and to identify potential opportunities for cooperation and de-escalation of the conflict. Rachel Carson: Environment, Science, and Faith? The Kozmetsky Center hosted Visiting Woodrow Wilson Scholar, Dr. Robert Musil, who is a leading authority on climate change, environmental health, energy, and national security policy. He offered a lecture on the topic of his book Rachel Carson: Environment, Science, and Faith (Rutgers 2014). The Kozmetsky Center hosted a visit with Mari Skaare, NATO Secretary General’s Special Representation for Women, Peace and Security, for a lecture on the role of women in global security, conflict and peace. The purpose of the visit was to share perspectives on security and economic circumstances in South Eastern Europe, and to explore opportunities for building academic cooperation in the region with St. Edward’s University and associations with the wider Austin community. On On Tuesday January 23, 2018 the Kozmetsky Center held another session in our ongoing international seminar exchanges on contemporary global issues among students of St. Edward’s University with the Moscow State Institute of International Relations of the Ministry of Foreign Affairs of the Russian Federation (MGIMO) and Friedrich Schiller University in Jena Germany. 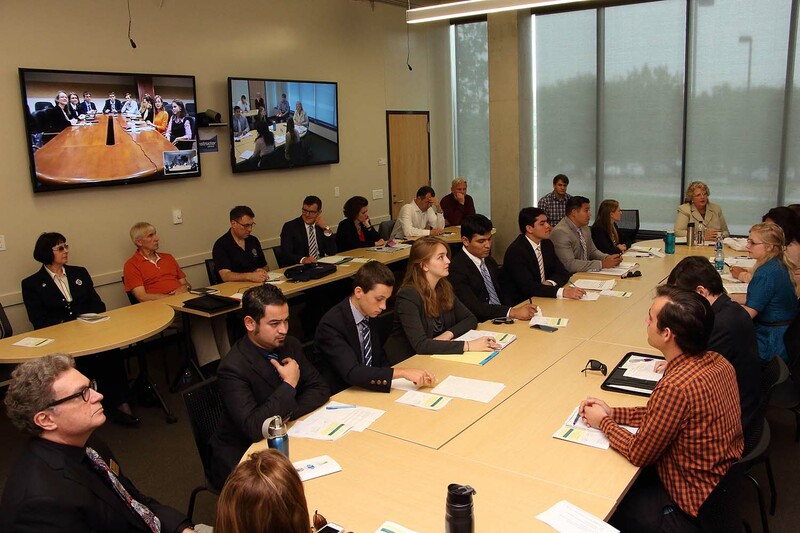 The students of the three universities met via our global classroom in Munday Library on the St. Edward’s University campus for the Austin, USA-Moscow, Russia-Jena, Germany seminar session to exchange perspectives on the impact of “fake news” (topic suggested by colleagues in Germany for this session). The discussion among students at the three campus sites focused on consequences and concerns regarding the impact of “fake news” on elections, economic performance, culture and society. The collaborative student seminar exchanges on contemporary global issues represent a US-Russia-Germany university partnership series ongoing since 2014.